Entering the studio in the morning I see bags of clay, jars of glaze and colored slips, and a mass of tools waiting to be put into action. Leaving in the evening I see teapots, bowls,and mugs drying under plastic, waiting for the next step in the process of becoming. It is in that process of evolution that I find a challenge, and loads of fun. While my end product may change over the years, I can’t imagine being without the feeling of shaping and creating with clay. I make pots because I enjoy it. It’s that simple. 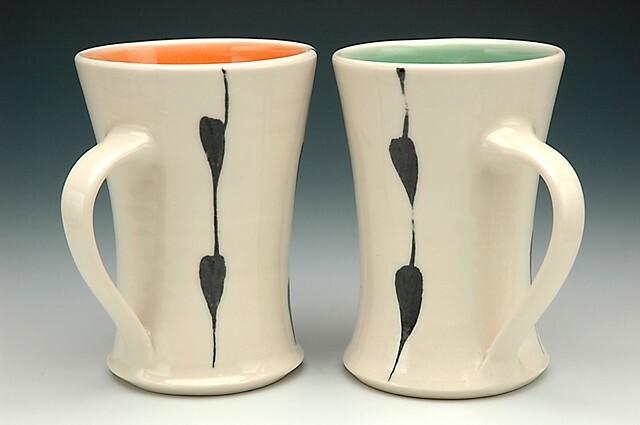 I have chosen to work in porcelain because I love the way the clay moves through my hands as I center it. It rises slowly and softly upward at my command. (most of the time). A bit of pressure shapes the bowl or vase or pitcher. Leaning back from the wheel, I enjoy seeing that clean and crisp “blank canvas” waiting to be glazed, decorated or carved. I am often influenced by the Asian esthetic of simple line and form. My goal is to create objects of beauty that reflect careful craftsmanship, are sophisticated in style. When someone says "I have breakfast with your mug every morning"...I'm happy.